be angry about sexism, about how a beautiful color could become oppressive and limiting. In my art, I use the color pink as a metaphor for the conflict between feminism and femininity. I use pink as a symbol, to express my defiance. I use it to reclaim the intelligence and power that women are born with. As a young girl, I was deeply engaged with knitting, embroidery, crocheting and weaving. Over time I became even more connected to the unrecognized “women’s” tradition of textile arts. My respect grew for the skill, vision and time that “female work” requires, both small and large-scale projects. 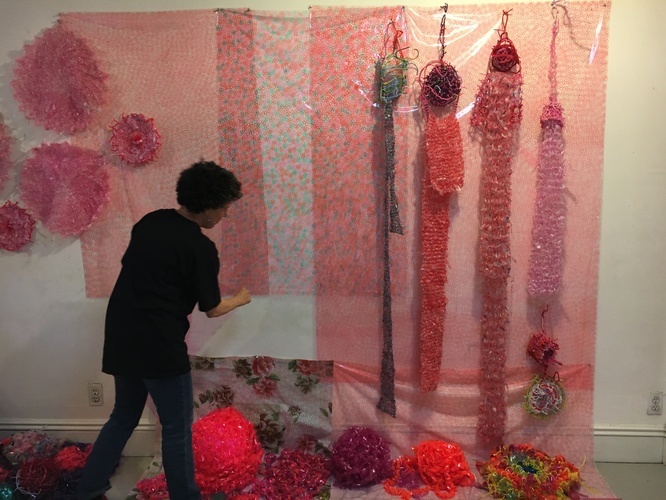 My current artwork includes wire tapestries and installations full of patterns informed by the color pink. I draw on fabrics and yarn, stain chenille pipe cleaners, knit and weave plastics. I take old diaries and draw in them, making the words unreadable until only the emotion remains. I have devised my own knotting and weaving system, allowing me to combine all of these materials to create large, intricate pieces. The patterns I create have a strong emotional field with stories hidden inside, waiting to be revealed. Using non-traditional materials like chenille pipe cleaners and Dura-Lar as opposed to standard textiles, my work becomes a bridge between past traditions and contemporary approaches to textile work. My desire is to make the undervalued, unseen culture of “women’s work” more visible.